October is national breast cancer month and women everywhere are thinking pink - they are participating in events, donating money, or showing their support in various ways. 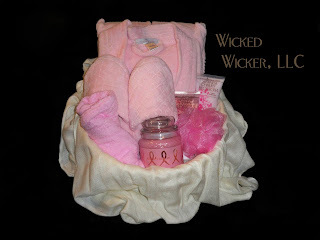 At Wicked Wicker, we are taking up the pink ribbon with our version of a "Think Pink" Gift Basket that was donated to the Women's Enterprise Foundation. All proceeds that were raised for this basket went to the foundation.